Teriyaki Boy Promo for Birthday Celebrators! 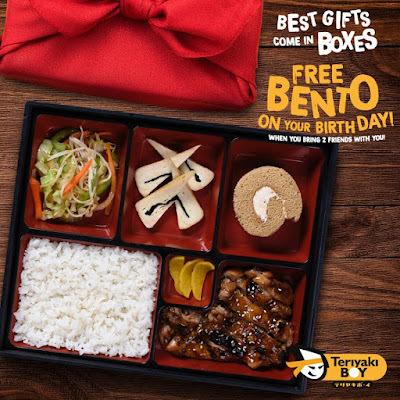 Wrap up your special day with a special gift box for FREE from Teriyaki Boy! .. Teriyaki Boy’s Promo for Birthday celebrators! Dine with two (2) other friends, and get a Teriyaki Boy Chicken Bento Box, for FREE! What better way to celebrate another year than a day at Teriyaki Boy. Available in all Teriyaki Boy branches nationwide!